Iron Mountain Hot Springs will be closed May 14, 15, and 16. Situated alongside the beautiful Colorado River and surrounded by Rocky Mountain views that soothe and inspire, our 16 geothermal soaking pools offer guests a pure soaking experience—the way nature intended. Our freshwater family pool is cooler and ideal for all ages. An attached elevated jetted spa provides yet another opportunity to relax. Thoughtful amenities are built in throughout: towel tree sculptures at each soaking pool, changing rooms stocked with complimentary shower products and a restaurant that serves food and drinks adds to the ambiance. Welcome to Iron Mountain Hot Springs. We invite you to relax, restore and rejuvenate. 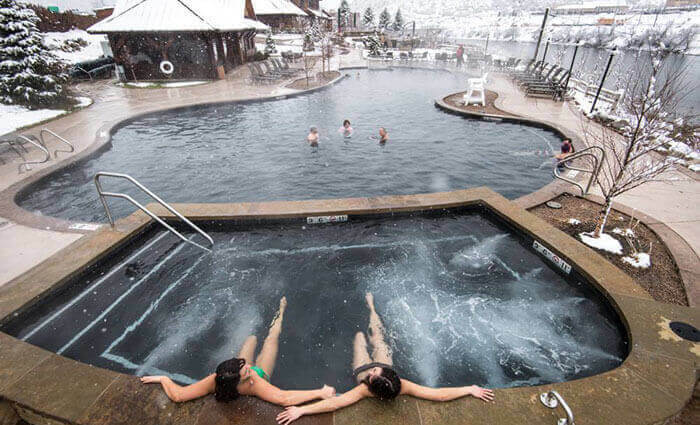 Iron Mountain Hot Springs is the perfect place to rejuvenate after an exhilarating day on the slopes! 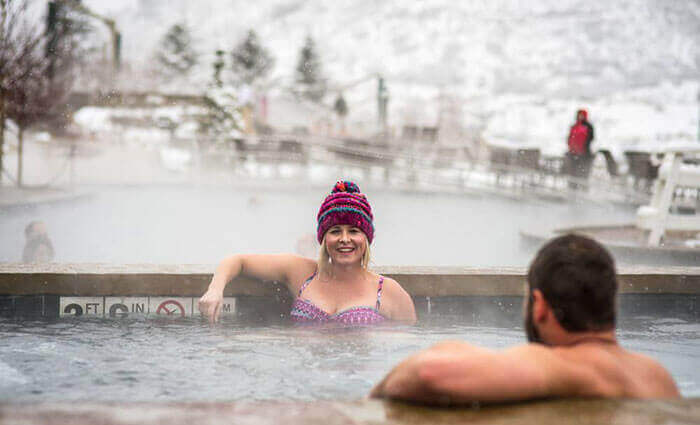 Find some time to unwind and connect with friends at Iron Mountain Hot Springs. You deserve it! Fun for the whole family! 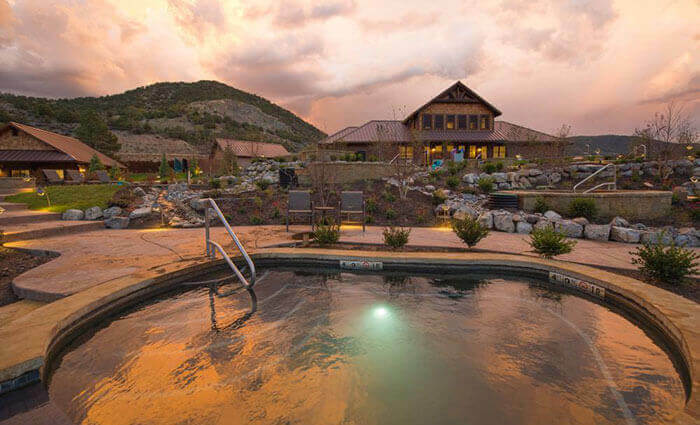 Visit Iron Mountain Hot Springs to relax, restore and rejuvenate in our iron-rich thermal waters. in our 16 natural soaking pools. Gracefully terraced on a hillside overlooking the Colorado River, each pool differs in shape, temperature and experience. No two are the same. There are pebble-bottomed reflexology pools, a heart-shaped pool for romantics, some that feature infinity views, another with a waterfall—try them all and find your personal favorite. When you’re ready for a break from the heat, cool off on lounge chairs, in our outdoor showers during the warm season or take a dip in the nearby family pool. your body, mind and soul as you immerse yourself in our soaking pools. Step into our healing mineral hot spring water and leave your cares behind. The naturally heated water works wonders for teasing out tension. Iron Mountain Hot Springs pools range from a warm 99°F to a toasty 108°F (37 – 42°C). The serene ambiance is further enhanced by the soothing sounds of spa music. To keep the mood tranquil, adults are encouraged to speak in soft tones and children younger than 5 are not allowed in the small mineral pools. in our healing waters. Iron Mountain Hot Springs contains 14 health-boosting minerals that go to work to make you feel blissfully relaxed. As the waters soothe your body, allow your mind to drift. Take in the spectacular views of the Roaring Fork Valley—snowcapped Mount Sopris, rugged Red Mountain and the Colorado River. Welcome the day with a quiet morning soak; as the day wanes, watch a colorful sunset or marvel at the night sky while you soak. Such a peaceful environment. The ambiance, soft music and lighting at night is so special. Probably one of the most relaxing experiences. I dipped in almost every pool, enjoyed a couple drinks and had the best time! Extremely clean and professional staff. Multiple pools to choose from. Towels provided for a small extra fee. The locker area was clean and easy to access. We stayed for the sunset. The river and mountain view were perfect. They do have a bar if you enjoy having a few drinks. Out of several hot springs that I’ve visited so far, this one is in the top 3 for sure. Very relaxing environment and the pools are absolutely amazing and refreshing! The people and the staff were welcoming, respectful, and quite friendly. Will definitely be back again! Highly recommend! This place is wonderful! Definitely the perfect place to relax and have a peaceful time. These are natural hot springs, no chlorine at all, which is awesome. This is an amazing place... the different pools, the landscaping, the atmosphere, it's all very well done. Highly recommended. This was our first winter Hot Springs experience and I have to say that it was pretty awesome. It didn't matter at least not while you're in the hot springs that it was 11 degrees out what did matter is that all around you are these magnificent snow cap mountains. The Hot Springs Resort in itself is very clean there are an assortment of Hot Springs based on temperature and depending on your body and what it can tolerate and after you've been soaking for a bit you will be amazed at how wonderful your body feels. I will look forward to doing it again. Everyone should check this resort out. So totally amazing and one of the best experiences that was long over due. Staff was very friendly and professional and the bathhouse was absolutely clean. Take a moment to pamper yourself at Iron Mountain you won't regret it one bit! Amazing place! A must stop, I promise you will leave relaxed and rejuvenated!! You will leave this place feeling great! One of the best hot springs!! Many hot pools with different temperatures. The view is awesome. Very friendly, clean and romantic atmosphere. Had so much fun soaking in the springs in the middle of winter. We got there right as they opened and there were about a dozen others already there, but it was quiet and relaxing. We stayed for about two hours soaking in all the different pools. The locker rooms were spotless and had a high end feel, especially he showers! I would absolutely recommend stopping here! Love the variety of pools and different temperatures. So you can warm up and cool down a bit or just get a different view. Beautiful right next to the river as well. And free lockers is a huge plus! PLEASE NOTE: We will be closed May 14, 15 & 16 for cleaning and upgrades. We will reopen Friday, May 17 at 9 a.m.